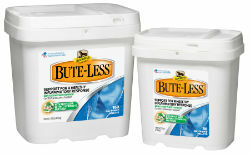 A proven alternative in relief for horses with discomfort, Bute-Less® uses natural ingredients such as Devil’s Claw, vitamin B-12, and yucca to help ease aches and discomfort associated with normal daily exercise and activity, training, or competition. Provides long-term comfort and recovery support. Supports a healthy inflammatory response. Gentle on the stomach. Administer one scoop daily for an adult horse weighing 1,100 lbs. Adjust the amount according to horse's actual weight. Enclosed scoop delivers 1 oz. of pellets.